Puzzling question .... ? - Skeptics Forum. The clock keeps going for a long time before the battery gets low and needs replacing. The clock never stops altogether (a smooth '3rd hand' moves continuously around the face), it just starts losing maybe a second a day for a time and when it gets to the stage of showing 5 or 10 mins slow, that's when I usually replace the battery. The thing is - just recently I find that it's actually doing the opposite - seems to be gaining a little each day and showing the time as fast! Like now .... For the past week it's been showing something like 5 mins fast each day. The time right now is 3:09 - and the clock hands are showing almost 20 past 3. The battery was put in about 4-5 weeks ago and the clock was telling exact time until about a week ago when it started gaining. How is this possible? Would it be something to do with the mechanics of the clock itself(?) Or could it be that some types of 'C' batteries might be stronger than another type. At present it's an 'Energizer' ® Advanced battery. Hmmmm .... FORGET ALL OF THE ABOVE >>> I need to come back to this because now everything@s gone a bit skew whiff!!! I went to open the back of the clock to see the make of the battery - and as I did so I noticed that the time was showing 6 minutes to 3 !!! It actually altered while I was typing this!!! Took the battery out and put it back in - smoothy hand wouldn't budge. Stuck at 6 mins to 3. So I have just replaced it now with a completely new 'Energizer' ® Advanced battery, fresh out of the packet. Still nothing. Not a peep. I brought the clock over to the desk where I am typing this - opened the back again, trying all sorts - still not a peep out of the clock .. 6 mins to 3 - BUT my computer and keyboard started doing crazy things ... not typing what I wanted it to ... Whichever key I pressed it would just give me >>> or +++ !!! Now comp is fine - but clock dead as a dodo - stuck at 6 mins to 3. Definitely something weird going on here ... IT'S A SIGN ...!! Re: Puzzling question .... ? I have since purchased a new battery which I have now inserted into the clock straight from the pack. The second hand is now moving as it should and so far it continues to show the right time. That was about 20 mins ago. I am going to check it every day at the same time to see whether it remains accurate, or if it continues to gain time. Obviously an alien spaceship was hovering over your house....they have a strange effect on electrics. Oh, why didn't I think of that? Actually, it's no longer a puzzle. Even just in the last hour that's passed, it's 'lost' about 15 minutes! On closer investigation, I noticed a few little scratches on the glass face - THEN it dawned on me ... the clock actually had a fall - just over a week ago, when I was polishing; it fell to the floor with quite a bang. I remember thinking at the time I hope I haven't broken it, but found it was still working when I picked it up ... Obviously, the mechanics (weighting or something?) have been knocked out of sync, and that's the cause of it! Such a shame ... 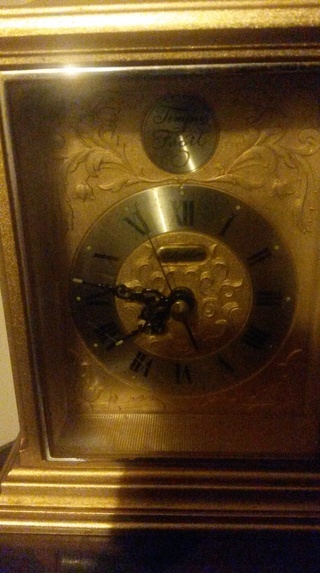 I love that clock, it was a present and has a sentimental history that goes along with it. I don't suppose there's too many places around nowadays that will even bother to repair something like that. 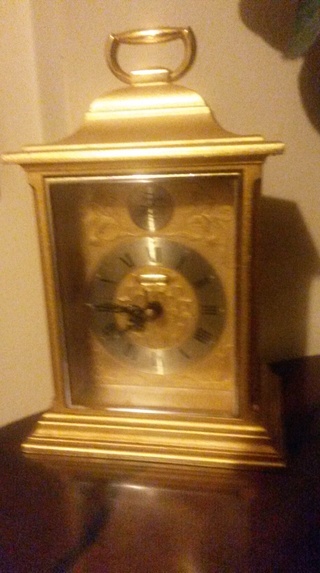 Strangely - I have a friend who is a specialist clock and watch repairer. Post a photo of the offending timepiece and I'll see what he says. It's now 9:00am next day and the clock is showing 7 mins past 6. It's a consequence of the Internet of Things, in which all of our electronic household equipment becomes interconnected. Clearly your clock was very upset at being dropped and then fiddled with, and your outraged computer quit in sympathy. And this is only the beginning of the AI revolution. This is the fate that befalls us all, who dare question the integrity of Uri Geller. There's nothing for it but to set to time to 7 minutes past ten and take the battery out. It's just an ornament now. I showed my friend the photos and he said he could probably sort it out. I was about to answer by saying that the clock is still working, in that the hands still move, and the secondhand still goes around smoothly, but that it's losing time (lots of it) on a daiy basis, so no point in relying on it as a time-keeper any more - just, as Matt says - an ornament now. Went to look at it (real time 9:50pm) to compare the time that the clock was now showing - and .......... it was showing 10 to 10 !!!!! Exactly what the actual time was! I haven't touched it since my previous post here. ETA: Now it's showing dead on 10 o'clock (which IS the correct time!). PS: Yesterday the main ceiling light went off here in the living room. Kaput! It's one of those everlasting bulbs, long life - which hasn't been in there all that long .. 6 months at the most. Wasn't too bothered, turned off the switch and thought I'll put a new bulb in today - I've got plenty of table lamps (and candles ) in the meantime. Guess what - switched on earlier today before getting the stepladder out - and it's working fine. I do recall that the very first electronic watch I owned - decades ago - worked perfectly, as long as I wasn't wearing it. As soon as I put it on, it kept stopping and starting whenever it felt like it. That one went back to the shop sharpish, and I haven't had that problem again.